Monsignor Khaled Akasheh is secretary of the Commission for Religious Relations with Muslims and bureau chief for Islam at the Pontifical Council for Inter-Religious Dialogue. Ordained in 1978 in the Latin Patriarchate of Jerusalem, he joined the pontifical council in 1994. 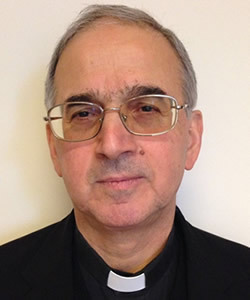 Akasheh was one of the Vatican's participants in the 2008 Catholic-Muslim Forum following the publication of the open letter "A Common Word Between Us and You." He earned a Ph.D. in biblical theology from the Pontifical Lateran University and a licentiate from the Pontifical Institute for Arabic and Islamic Studies.